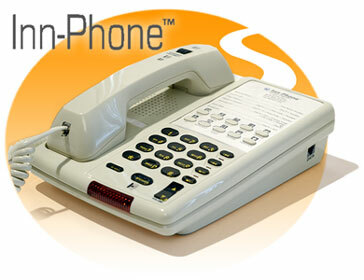 The highest quality guest room telephone at any price. Now available at a fraction of the cost of "standard" units. Free faceplate customization. Very large faceplate area. 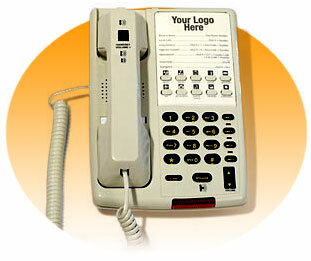 Includes full color custom printing of your logo, guest services key lables, directory and/or dialing instructions. 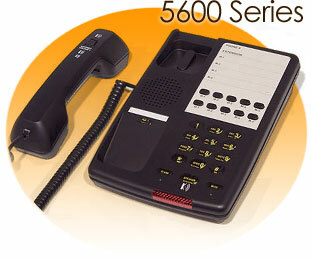 Compatible with virtually all analog port PBX message waiting systems without any additional programming. 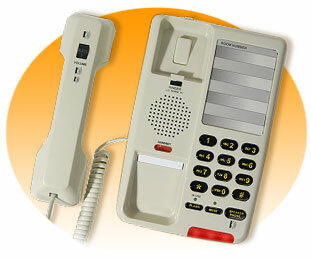 Rotary Handset Volume Control plus additional Volume Boost Button on base. 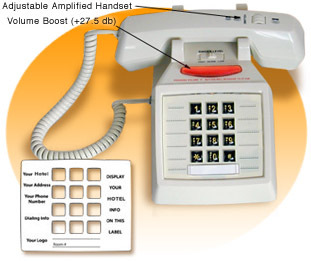 Handset control provides amplification to 18db. Boost Button provides additional to 27.db and automatically resets on hangup (required by FCC for levels over 18db). Exceeds all ADA & FCC standards. Most hearing loss occurs in the higher end of the audible spectrum. CLEARING AID circuity selectively boots this end portion for improved clarity.